Ms. Katherine is the Ranger who gives the class in the nature center and she does such a wonderful job! 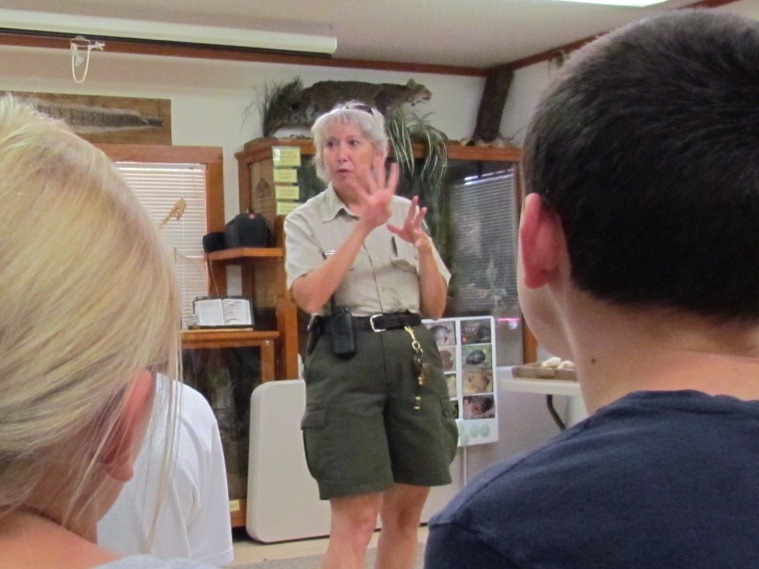 She involves the kids and adults, works hard to set up the nature center to be an interesting interactive learning center, not to mention she has a wonderful personality! 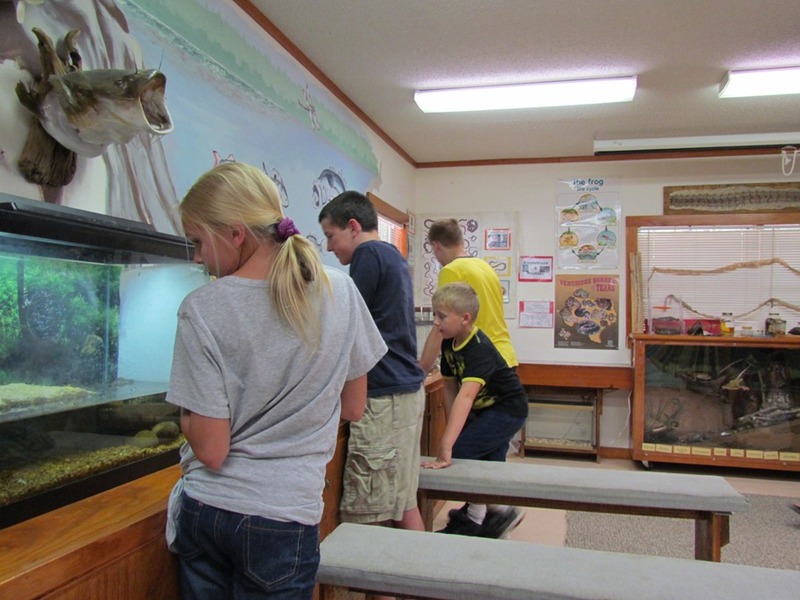 Anna, Matt, Adam, & Austin checking out the various reptiles which includes, baby alligators, turtles, and corn snakes! We had our three kids plus one again, Matt has become our “public exchange student” over the summer. He exchanged public school to homeschool with my kids temporarily. Much to his “dislike”, he will have to return to public school at the end of August but we will enjoy him while he can come with us on some of our escapades. We arrived a bit early so we looked around the Nature Center. Ms. Katherine talked to us about some of the exhibits. 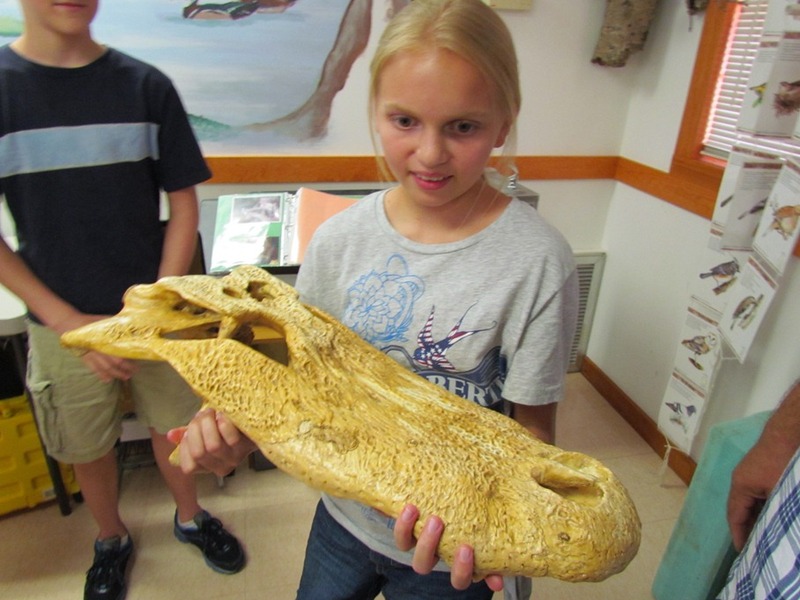 Each of the kids took turns holding the alligator skull as Ms. Katherine explained about how alligators regrew its teeth and other interesting facts. 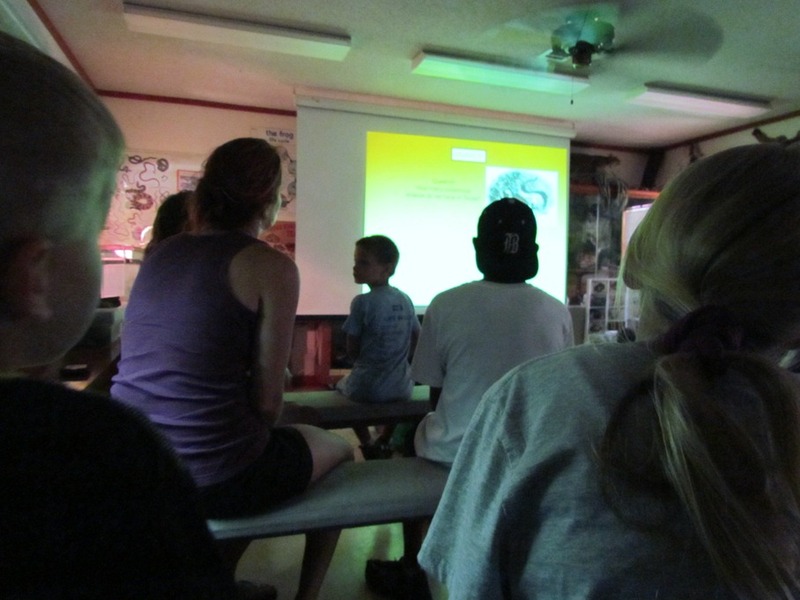 More people begin to arrive and we all took a seat in the classroom and watched a slide show about venomous snakes and how to tell them from non-venomous snakes. 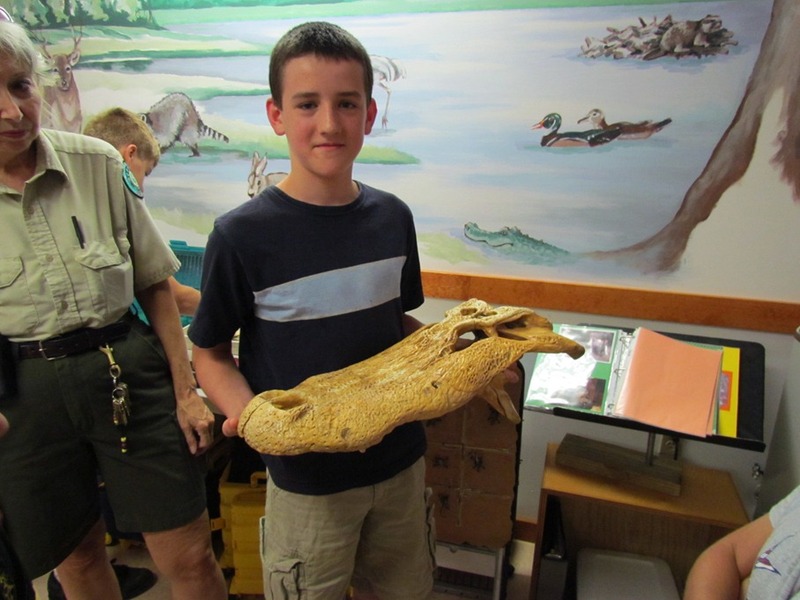 There was a lot that even Stewart and I learned about the different snakes. 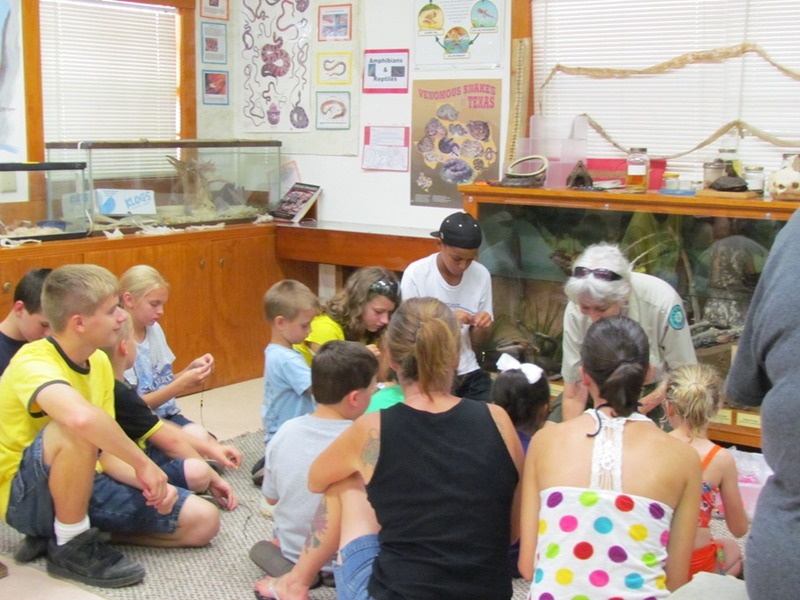 After the slide show the kids all got on the floor with Ms. Katherine and made a Snake Identification Keychain to help them remember the venomous coral snake’s colors. “Red touch yellow kill a fellow; red touch black venom lack.” The kids had to say the rhyme to Ms. Katherine but Anna was too shy in front of all the other kids to recite it back. Hopefully with us going to things like this she will learn to open up a bit more. 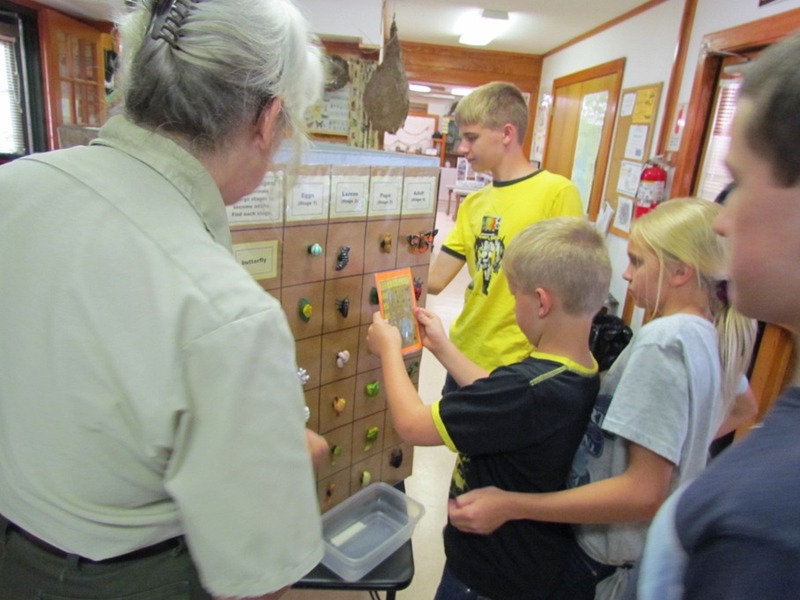 After the crafts, everyone started to leave but Stewart and I let the kids look at some more of the exhibits and Ms. Katherine showed them about the life cycles of the different insects and about animals tracks. 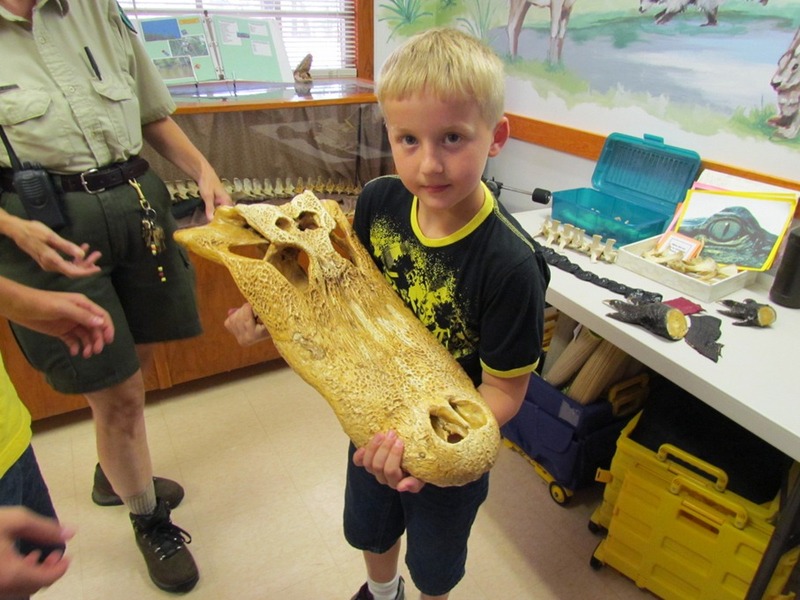 Be sure and “like” the Texas Parks and Wildlife – Martin Dies Jr. State Park Facebook page so you can get updates from their events calendar! 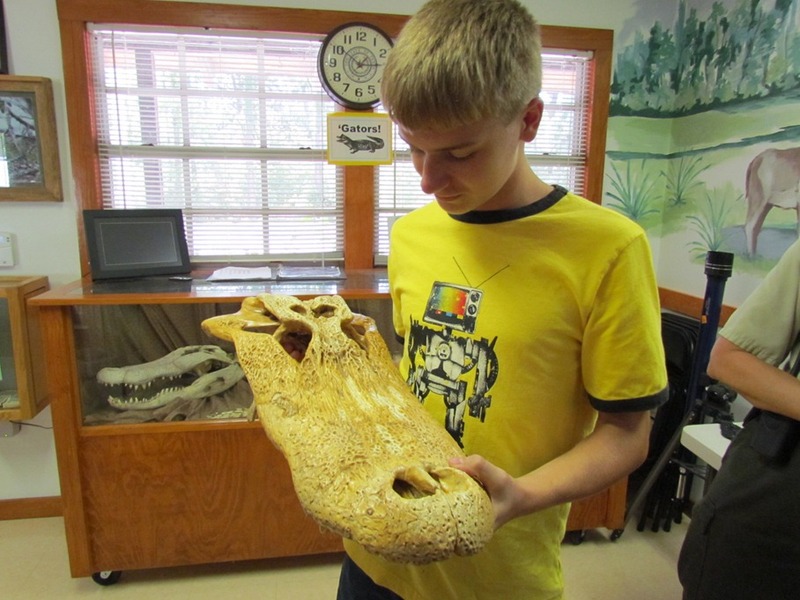 Posted on July 24, 2011, in Homeschool and tagged Biology, Science. Bookmark the permalink. 1 Comment.